Puch Athena 45mm 70cc cylinder kit. This is the large reed block version, the 'mini gila" as we call it. OEM replacement decompression valve for Sachs 504 and 505 cylinders. Will also work great on the Sachs Athena cylinder kits. Used but came off of a running bike. Comes with the cylinder, piston, piston rings and wrist clip. This bike was doing easily 35mph before I put a kit on it. You can slap this on and go. Tomos a35 44mm Airsal kit with everything you'll need. 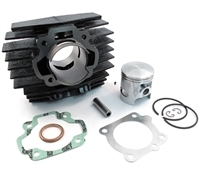 44mm 65cc Airsal cylinder kit for Derbi flatreed engines. The porting on this is awesome - 3 big transfers with 4 booster ports and a huge exhaust. Aluminum cylinder body with nikasil lining the bore. 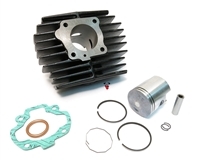 Motobecane 39mm 50cc Airsal cylinder kit for any av7 or av88 engine. Massive port 46mm 70cc cylinder for Peugeot 103 engines. Has three massive bridged port transfers and 4 booster ports plus a huge exhaust. Tomos A3 44mm 70cc Airsal kit. Keep in mind this is the 10mm wrist pin version for A3 engines. Tomos A35 38mm 50cc Airsal kit. Great as a stock replacement cylinder with a definite performance upgrade in speed! Tomos a55 44mm Airsal kit - massive fins for super cooling abilities. 70cc 43.5mm kit for Sachs 504 and 505 engines. Includes cylinder, head, gaskets, angled intake, piston, wrist pin, wrist pin clips, rings, m6 hardware and a set screw for blocking off the decomp. 45mm 70cc airsal kit for puch e-50 and za50. Motobecane 70cc airsal cylinder kit for both av88 and av7. 45mm piston. 38mm 50cc airsal kit for puch e-50 and za50.